If you have family or guests coming and bringing their own boat or personal watercraft, be sure to tell them about the Hubbard County Decontamination Station in Park Rapids and encourage them to use it. Watercraft decontamination is a free service provided by the Hubbard County Environmental Services Department. 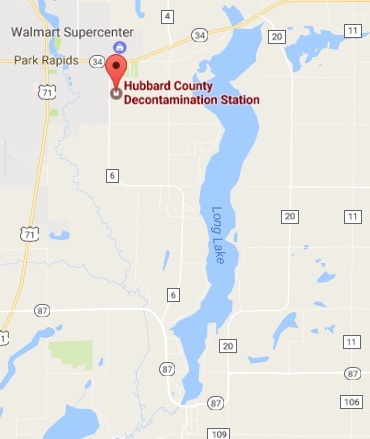 Map to Hubbard County Decontamination Station: It is 6 miles from South Access and only 2 miles from the North Access of Long Lake. If you are a boater, angler, water-skier, sailor, jet ski user, canoeist, etc. - there are some important things you can do to prevent the transport of harmful invasive species from one lake or river to another. In Minnesota it is illegal to transport aquatic invasive species. Inspect and remove aquatic plants and animals before entering/leaving access and drain water before leaving access. Dispose of unwanted live bait in the trash, not in the water or on land, then spray, rinse or dry boats. Save a suspected invasive plant or animal in a sealed plastic bag. Report location of suspected invasive species to the MN DNR Invasive Species Specialist, Nicole Kovar, at 218-732-8960, ext. 222. Do not transport aquatic plants, zebra mussels, other prohibited invasive species. Do not launch a boat or place a trailer in the water if it has aquatic plants, zebra mussels or other prohibited invasive species attached. Transporting invasive species in Minnesota is subject to a $250 civil penalty, launching is subject to $500 to $1000 civil penalties.